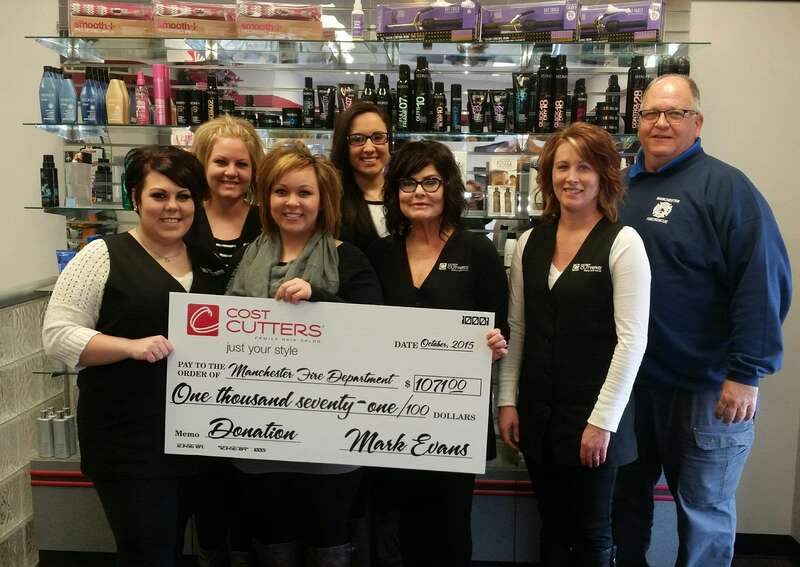 The ladies at Cost Cutters in Manchester recently hosted a fundraiser, with the proceeds going to the Manchester Fire Department. During the month of October, in which Fire Prevention Week falls, a portion of customers’ receipts were set aside for this campaign. Fire Chief Mike Ryan says the funds will be deposited with the Manchester Fire Fighters Association and will be used for equipment purchases to complement the resources provided by the City of Manchester. All gifts directed to the Manchester Fire Department are deposited with the Manchester Fire Fighters Association (MFFA). The MFFA was established in 2007 and serves as a non-profit 501c3, making all donations tax deductible. Funds are are held in this account until the need to make equipment purchases arises. In the past, the MFFA dollars have been used to support the acquisition of equipment ranging from hand tools to fire engines. The members of the Manchester Fire Department appreciate the donations and support that they receive annually. These funds help insure the members have the trucks, tools, and personal protective gear needed to respond when needed.